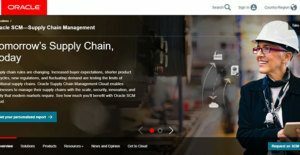 Oracle SCM is an extensive collection of supply chain management applications that are flexible, secure, innovative, and fast to address the needs of the current market environment. This multi-app platform offers top-tier features, can be deployed either in modular or integrated utilization, with flexible and open systems, and fully functional application. Oracle SCM offers a digital blueprint of a complete business approach that enables users to transform their typical supply chain process into a comprehensive business planning. In effect, this SCM suite is the only one of its kind that allows today’s businesses to create an advanced supply chain system, which can address the stringent requirements and complexity of tomorrow’s business environment. With functionalities that integrate comprehensive demand and supply planning, multi-channel order fulfillment, unified logistics, outsourced production, key material sourcing, and product development, Oracle SCM Cloud is probably the most sophisticated cloud-based SCM suite at present. Oracle SCM offers superior applications that offer sophisticated functionalities that generate more value. Its benchmark-focused structure helps reduce overall ownership cost, while its pre-installed universal framework apps facilitate decreased administrative expense. This suite’s verified solutions only incur short implementation period, which translates into a faster return on your investment. This unique SCM platform enables your business to integrate the value chain, projection, and operational alignment with top-level business planning as well as operations and sales planning. It also helps you advance innovation with comprehensive value chain management and first-rate product lifecycle management. Likewise, it assists users to adjust and accomplish order requirements using an extensive administration suite of apps and a top-tier transportation management. Overall, Oracle SCM allows businesses to perceive, create, and respond to supply chain demand, using the best demand management strategy and a full-suite value chain planning platforms. You can buy and install all component solutions of Oracle SCM either individually or as a comprehensive collection. Whatever option you choose or the setup required by your business, you are ensured of receiving best-in-class functionalities. What’s more, each component app or comprehensive suite carries the Oracle Lifetime Support Guarantee. This means that during the entire duration you’re using each Oracle solution, support is readily available. Overall, these features establish Oracle SCM as one of the most adaptable and risk-reducing collections of SCM solutions in the market today. Oracle SCM is an open-source, integrated, and comprehensive suite of supply chain solutions that incorporate top-tier functionalities with interchangeable buying and application options. This suite blends the digital value chain—either adaptive intelligence, IoT, or blockchain—with efficiencies such as unified demand and supply planning, diverse channel fulfillment, integrated logistics, contracted manufacturing, critical material sourcing, and product innovation. Oracle offers best-in-class benchmark-based application designs, software features, risk alleviation, adaptable deployment and buying options, and overall constant initiative for endless innovation. If you are considering Oracle SCM it may also be a good idea to investigate other subcategories of Best Distribution Software gathered in our base of SaaS software reviews. Since each company has unique business wants, it is prudent for them to abstain from seeking a one-size-fits-all faultless software system. Needless to say, it would be pointless to try to find such a platform even among market-leading software solutions. The clever thing to do would be to catalog the various vital aspects that require consideration such as main features, budget, skill levels of employees, company size etc. Then, you should do your groundwork thoroughly. Read some Oracle SCM reviews and investigate each of the other apps in your shortlist in detail. Such comprehensive homework can ensure you reject ill-fitting platforms and select the system that provides all the aspects you need for business success. How Much Does Oracle SCM Cost? With a free 30-Day trial for all plans. Rates and available features vary per plan, including the number of minimum users, planned item-locations, and prerequisite subscription to other Oracle product/s. We realize that when you make a decision to buy Distribution Software it’s important not only to see how experts evaluate it in their reviews, but also to find out if the real people and companies that buy it are actually satisfied with the product. That’s why we’ve created our behavior-based Customer Satisfaction Algorithm™ that gathers customer reviews, comments and Oracle SCM reviews across a wide range of social media sites. The data is then presented in an easy to digest form showing how many people had positive and negative experience with Oracle SCM. With that information at hand you should be equipped to make an informed buying decision that you won’t regret. What are Oracle SCM pricing details? What integrations are available for Oracle SCM? If you need more information about Oracle SCM or you simply have a question let us know what you need and we’ll forward your request directly to the vendor.